Step Up on Fifth, located in the heart of downtown Santa Monica, is a five-story affordable housing complex built to offer support services and rehabilitation for the local homeless and mentally disabled population. Completed in 2009 by Los Angeles-based architecture firm Brooks + Scarpa, the building, a former parking structure, integrates 46 studio apartments with ground-level commercial space. This ink and color pencil sketch emphasizes the firm’s solution for transforming an abandoned structure with color, texture and geometric form. This object is now on view as a part of the exhibition Making Design: Recent Acquisitions. Andrew Gardner is a Curatorial Assistant at Cooper Hewitt, Smithsonian Design Museum. Mimi Zeiger, “The Face of Change,” Azure, September 2009. 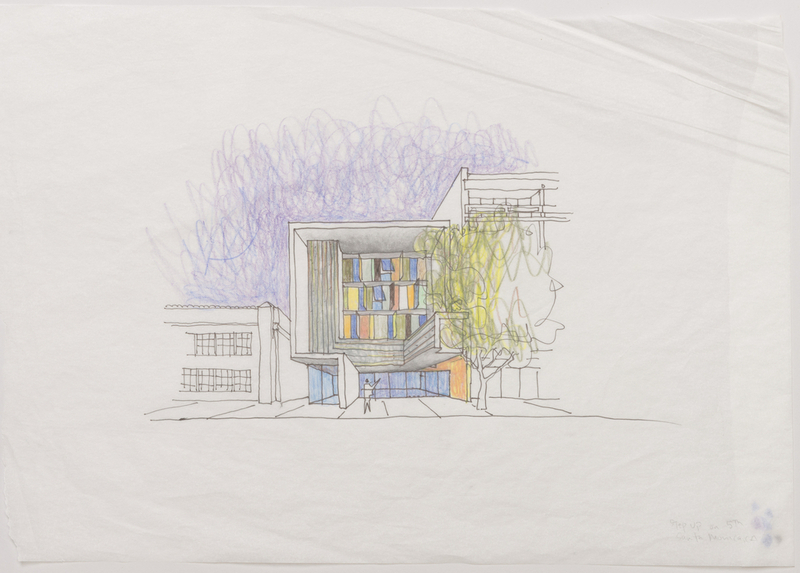 Drawing, Step Up on Fifth: Santa Monica, CA: Sketch of Elevation, ca. 2009. pen and black ink, colored pencil on tracing paper. Gift of Brooks + Scarpa. 2015-40-1.